Divide the potato mixture into 8 balls. Flatten each potato ball and stuff it with the mushroom mixture. Lift the sides and seal the mixture and shape it into a oblong roll. Beat egg whites and keep in a bowl. Dip the rolls into the egg whites followed by breadcrumbs and coat evenly. Heat oil in a pan and deep fry them into golden brown. Serve with tomato ketchup or Mint chutney. yummyyyyyyyyy.......... Hd tried it last week end. It really tastes very nice. Evry1 in my family loved it. 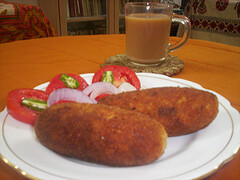 You and few others like tasneem, Lata, Kirti, Dairyman and rabz, have excellent recipes on this site. I look forward to your recipes thank you so much Anand bhai. One can use batter of maida (all - purpose flour) instead of egg white. Thus who do not eat egg can also have it.